Hey guys! Remember a few weeks ago when I posted about being a Plaid Creator? If you missed the announcement, I’ll catch you up to speed. Plaid Crafts is celebrating their 40th anniversary this year and as part of the celebration they put together the first Plaid Creators team. We will be sharing creative projects of all kinds and inspiring you to get your craft on in 2016. Plaid debuted their Top 10 Hot Trends for 2016 and I chose the “Comfort” trend as inspiration for my first project. 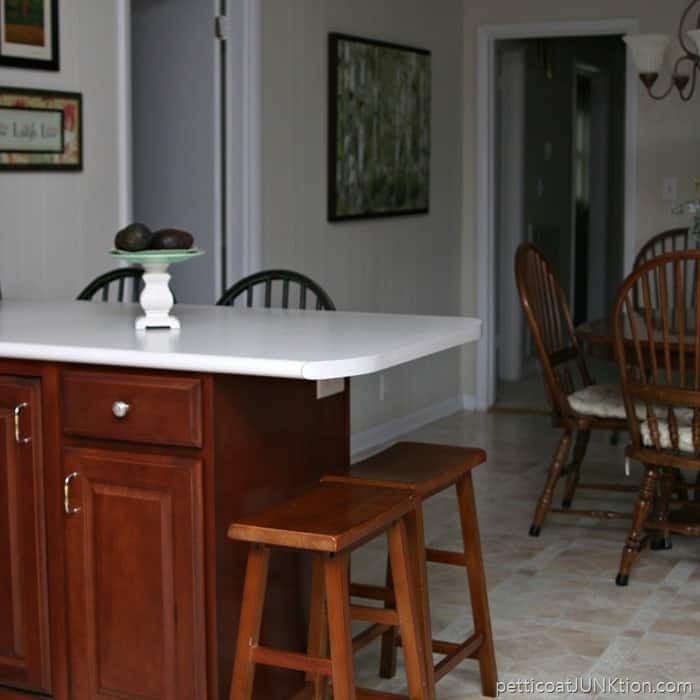 To say the pair of bar stools at the end of the bar/counter in our kitchen are boring is a bit of an understatement. Time for a makeover. 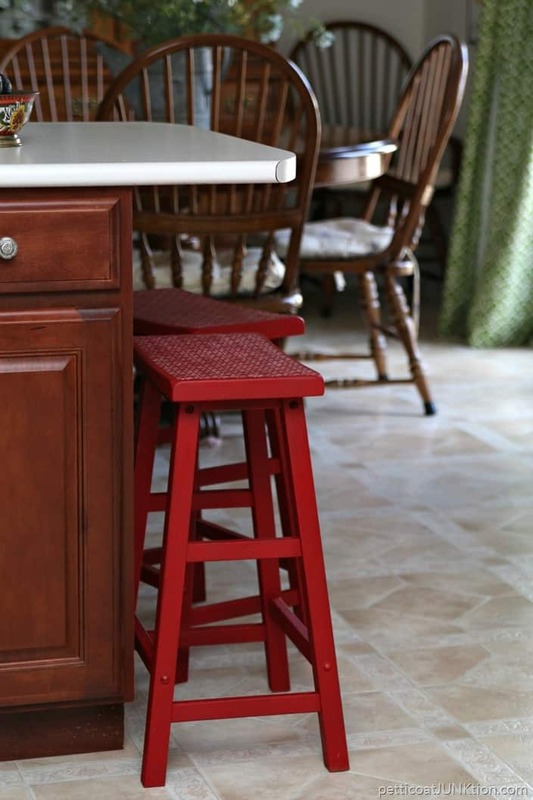 The color I chose for the bar stools is Imperial in FolkArt® Home Decor Chalk. The color is a beautiful, vibrant red. My dear mother always loved red. It was, and I guess still is, her favorite color. As most of you know, my mom is suffering from Alzheimer’s. We visited her in Arkansas last month and she was wearing a lovely red robe my sister got for her. 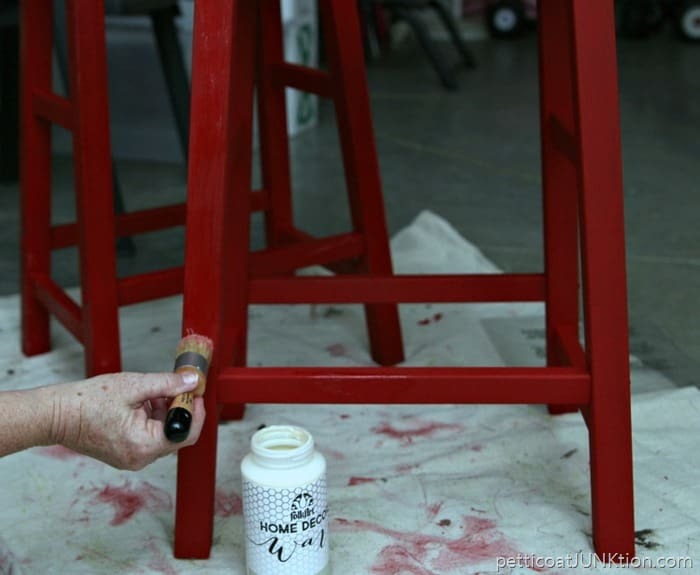 When I looked at the color board for the FolkArt Home Decor Chalk I knew immediately what color the stools would be. 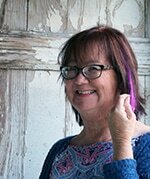 The JTS (Junktion Technical Specialist, aka my hubby) is getting pretty good at this photography thing. I adjust the settings on the camera and he clicks away. You guys know I couldn’t just brush on a coat of paint and be done. The stools needed to be gussied up with a few flowers. I taped the stencil to the stool…..poured a small dab of Vintage White FolkArt Acrylic Paint onto a paper plate…..dipped the stencil brush in the paint……brushed almost all of the paint off on a paper towel…..then started stenciling. 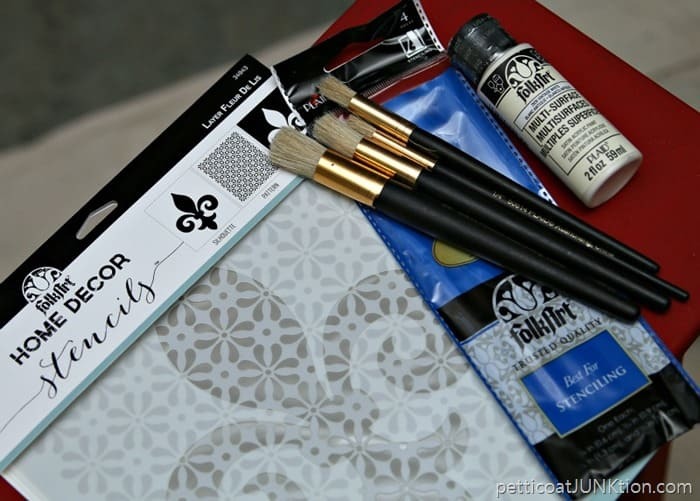 The secret to stenciling is a really, really, really dry brush. I stencil by making small circles over the stencil. Some DIY’ers prefer a sponge brush and pouncing. What ever works! I started stenciling at one end of the stool and moved the stencil down as I went. The little dots on the stencil serve as registers……makes for easy alignment. I’m not called the “Queen of Distressing” for nothing. I used 100 grit sandpaper to lightly distress the stool. The flowers recede into the paint and don’t look like they are just sitting there. 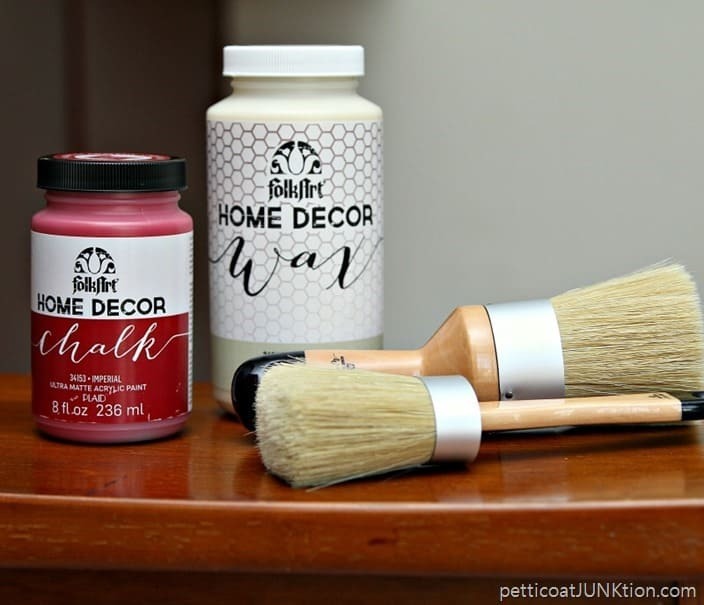 For the finishing touch I brushed on FolkArt Home Decor Clear Wax. I let the wax dry overnight then buffed it with a white lint free cloth. Ta-dah! The bar stools aren’t boring now. 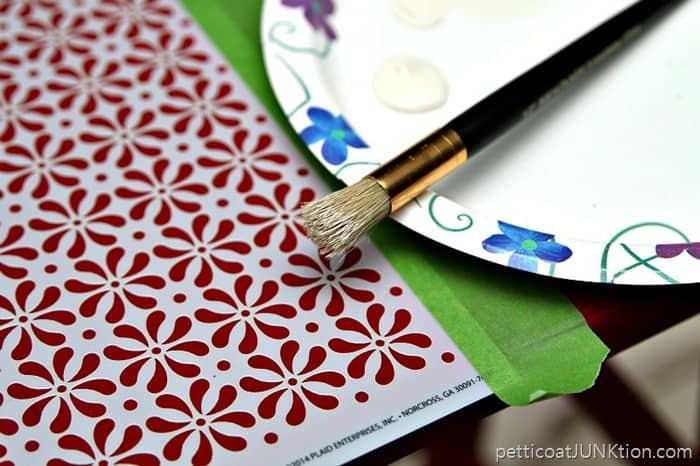 The beauty of stenciling is the perfectly imperfect look. 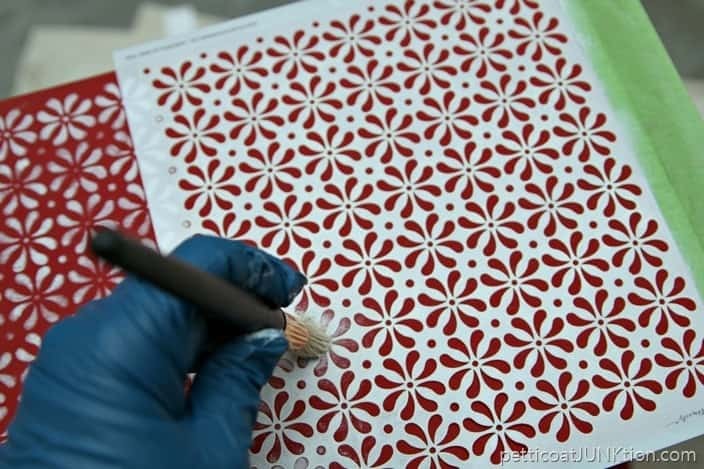 You don’t want all of the flowers or any stenciled detail to be perfect. Looks too store bought, not one of a kind. I can’t wait to hear Granddaughter Sofi’s comments on the stools. She pulls a one of the bar stools up to the oven every Friday night when we make chocolate chip cookies. Well, that’s my first project as a Plaid Creator. What do you think of the red…..and the flowers? As part of Plaid’s 40th Anniversary Celebration they will be sharing throwback crafty trivia, highlights about the history of crafting, and special giveaways all year long. To join the fun sign up for the Plaid newsletter and follow them on social media. Just click the “pink links” below. See the Top 10 Hot Trends for 2016 and tell me your favorite trend. Also get a look at the new Plaid products being introduced this year. 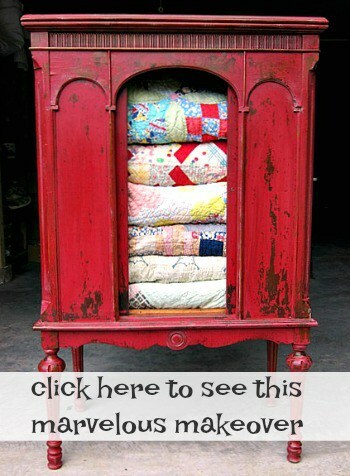 Click here to have Petticoat Junktion updates delivered to your email for free! I love how they turned out!! Just that little pop!!! Beautiful! Gives your kitchen that little extra. These look so great! Thanks for linking up at #merrymonday link party! They look great. Love the red. Makes them stand our more and love how you stenciled the top. Very creative. Thanks for sharing. Good job! They look great. I’ll be interested to hear how the tops hold up – whether you need another coat of wax after people start sitting on them? The red is so pretty and eye catching. Of course I agree with your Mom, red is my favorite color also. The stools look terrific and the flowers really give them a one of a kind look. Your stools are cute! I agree with everyone, they look great with your cabinets!! Thanks for the sweet comment Christy! I love red too. What a fun bright color to add to your kitchen! Red is my favorite color too and I’m loving the pop of red and the pretty floral stencil pairs well with your drapery panels. Pinning to share! 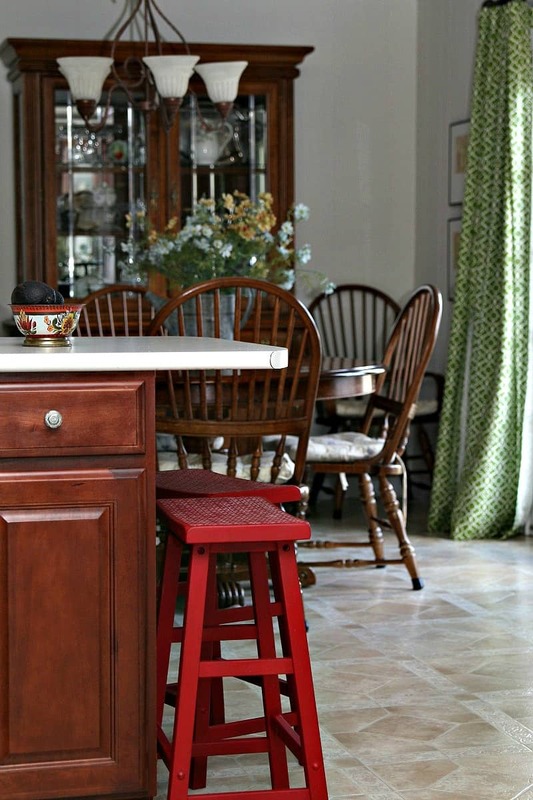 Love the red stools !!! Beautiful re-do! Your bar stools bring back memories—all the way to 1967, when I was a new bride. 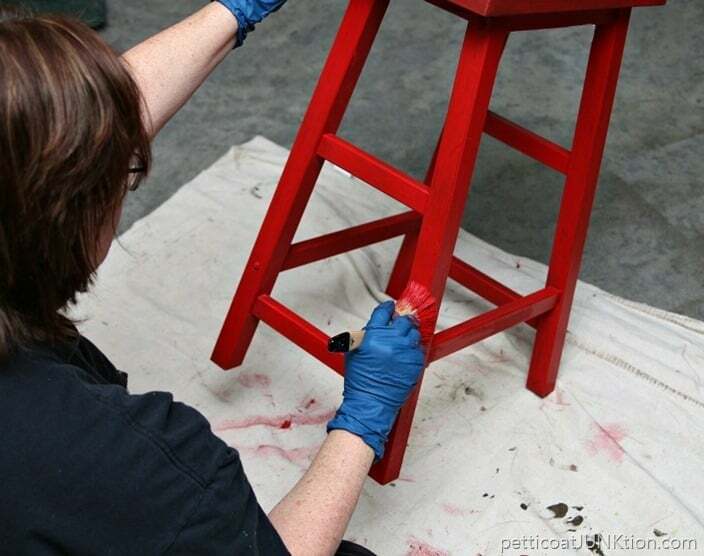 I purchased bar stools identical to yours, and painted them a vibrant red. The red is great, but those little flowers are perfection. I really need to start using more touches like that ..it looks so easy! Thanks for the great tips! Red is one of my favorite colors. The stools are terrific. They just pop in under the counter. Love the barstools Kathy! 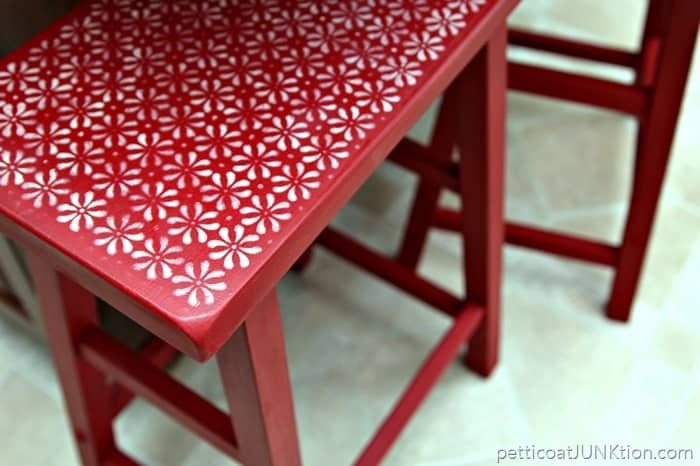 Love the red and the stenciling! So cheerful! I love the red! It really stands out next to the cabinets. The flowers on top were a cute touch! That stencil on top takes it to the next level! It looks great! Bravo Kathy, j’aime beaucoup ce rouge et le clin d’oeil à votre Maman. B eaucoup d’amour entre vous. That red is stylin’! Perfect color and that stencil is adorable too. Great pick, Kathy! I absolutely love the deep red color! It is the perfect about of pop for the kitchen. I think Sofi is going to be so excited about them being red and having flowers. She will love it! Good Morning Kathy~ The stools look great! They bring out a hint of red in your cabinets. Just the right amount for a pop of red. Terrific job there! I couldn’t stop at the stools, I would have to do the island too!